LaserSoft Imaging® presents a unique solution for fast and easy archiving of slides, negatives and reflective originals. With the new SilverFast Archive Suite you get a bundle of two programs: SilverFast Ai IT8 Studio and SilverFast HDR Studio. Since both programs are equipped with optimum functions, you will enjoy maximum processing speed as well as an efficient workflow. An integrated color management system that meets professional standards completes the convincing package. 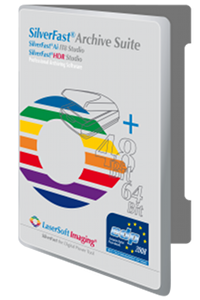 Using the scanner software SilverFast Ai IT8 Studio, you create 64bit/ 48bit RAW data for subsequent processing in SilverFast HDR Studio. These RAW files contain all the data of your images and are therefore ideally suited for further optimization and processing. The Archive Suite featuring full SilverFast functionality is ideal for professional use. The HDRi feature is part of any SilverFast HDR and Archive Suite edition version 6.6.1 or later. Therefore, the 64bit HDRi color files (and the 32bit grayscale files, respectively) developed contain all readable image information, including the information of the infrared channel, the data from which can be used for image optimization (e.g. dust and scratch removal). Hence, HDRi RAW data is the perfect source material for any later post- processing steps. The combination of SilverFast's Multi-Exposure® and patented Auto IT8 Calibration provides the best quality and safety possible. 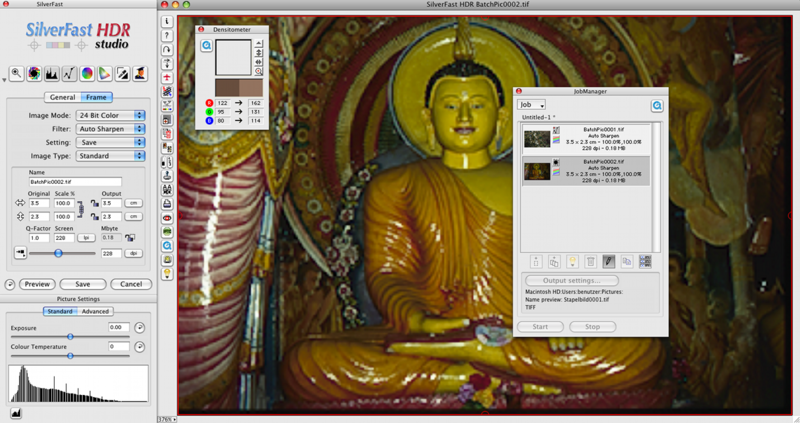 Since calibration data gets embedded into the files, you don't need to calibrate again when opening and processing them with SilverFast HDR Studio afterwards. 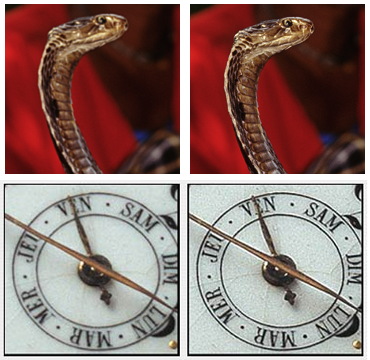 A permanent gamma value synchronization of the 64bit/ 48bit data secures predictable and consistent brightness and color reproduction between SilverFast Ai IT8 Studio and SilverFast HDR Studio. (Click to enlarge) After scanning with SilverFast Ai IT8 Studio, you can convert the RAW files with SilverFast HDR Studio. The conversion process uses the HiRePP® function. HiRePP allows amazingly fast opening of huge files in realtime and the ability to work with them almost instantly. Work with your RAWs at your workstation or in an external environment - or send them to Hawaii and have them processed there. The SilverFast Archive Suite will enable you to perform all the necessary steps for the professional and lossless digital backup of your treasured collections (which may have taken years or even decades to establish) on your own, without having to give them up to someone else. Only one single scan is needed; once the data is captured, it can be used in a variety of different ways. May it be a fine-art print, a presentation, a postcard or a web gallery. Notes: The Hot-Folder feature is available for the Archive Suite as a paid add-on and a suitable IT8 target is required for the IT8 calibration. 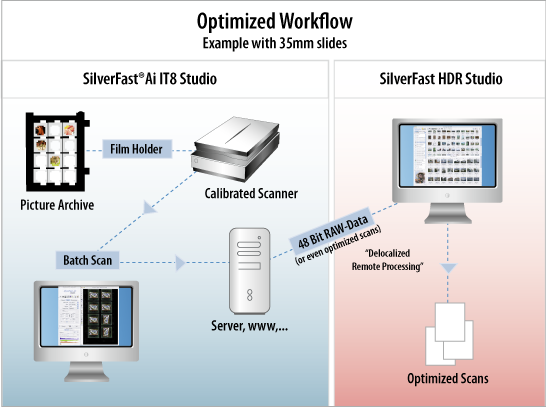 SilverFast Multi-Exposure® (support list), iSRD® (support list) and Auto Frame Dectection for filmholders (support-list) are hardware dependent. Please check if your scanner supports those features. Then when processed [...] the iSRD cleaning can be applied as part of the process to a finished image file." "... 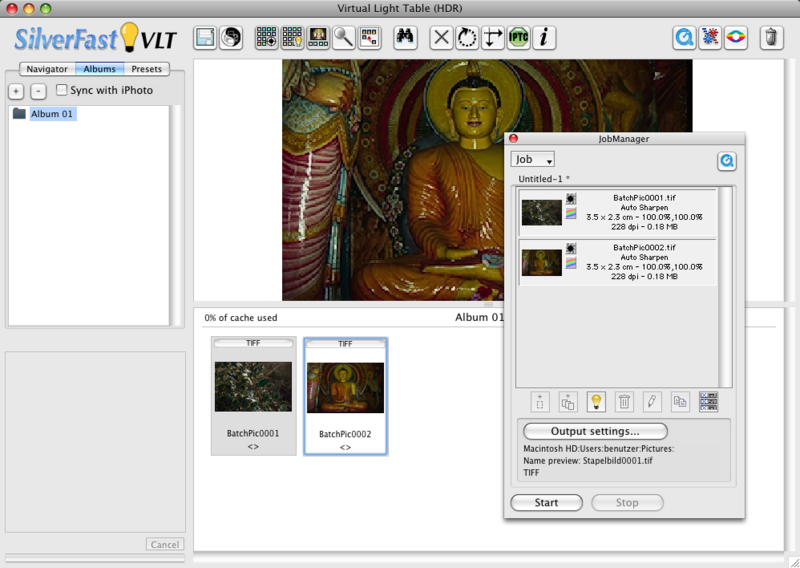 The 64-bit HDRi color files [...] contain all readable image information including the information of modern scanners’ infrared channels, using this data for image optimization, e.g. dust and scratch removal." "LaserSoft Imaging succeeded to develop a software that allows the effective digitization of large image collections in record time." "... I'm able to do any image processing later on with SilverFast HDR Studio. Following this procedure I can assure neither to lose a single scan in my archive nor any details by scanning." Screenshots of the user interface and some SilverFast Archive Suite features.